This set of photos was taken on November 29, 2017 at 2:20 PM. We decided to sit on this one for the past year because it looked to be the perfect candidate for the website banner and business card. The "Take It!" came as I wanted to have an appropriate photo to represent Fall and at the time the photo is needed to be posted as the banner for the season, everything is still fairly green and real fall like images are a number of weeks away. Thus for the first time I have taken these photo to put away until now when they can be brought out and used as the fall banner and business card. From last November until now the images were to rest and get ready. With Fall having arrived, we are now able to present them for all to see. I’m so glad we don’t have to take leaves here. 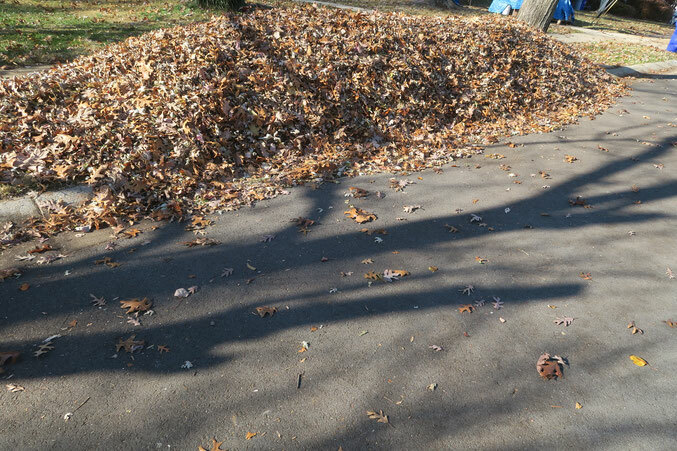 I have scolded my children many times through the years for jumping into a pile of leaves I just piled up. With our youngest I got a jump on the issue before it even started and told her there were slugs in the piles. My husband hated it when our kids would dive into the leaves, I always thought it was cute. I like how the shadow bends into the leaves, like they somehow rippled the shadow. I love the Fall. Unfortunately down here in Florida we don’t get much color. The reds, oranges and yellows you guys get up there are so beautiful. Hopefully you didn’t let the leaves stay in waiting for a year as well LOL!